Although social networking ad spend is growing in a tremendous pace, search is still the most popular location for advertisers on the web. In fact, not only that search is keeping his number one honorable place, but it may even just had its best quarter ever, where mobile search is leading the way in growth. According to a new report by the digital marketing firm, IgnitionOne, the fourth quarter of 2011 was the most profitable quarter ever of the search advertising industry, mostly led by heavy holiday season spending from retail companies. 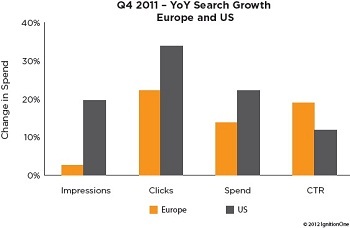 Overall, Q4 has generated an big increase in search impressions, clicks, CTR and of course spending. Both the U.S. and the European search markets have shown significant increase in search impressions (+20% US, about +3% EU), clicks (+34% US, +22% EU), CTR (+12% US, +19% EU) and most importantly spend (+22% US, +14% EU) where the U.S. is in front at almost all segments. The fast growth of the mobile industry is resulting a big jump of mobile search. 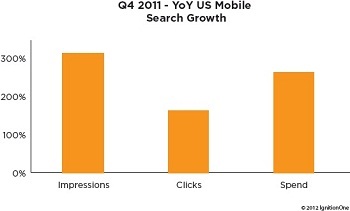 In the fourth quarter of 2011, U.S. mobile search has increased in amazing numbers: 317% in impressions, about 170% in clicks and 269% in mobile ad spend. It is indicated that mobile search ad spend constituted for 14.2% of the total paid search budget of retail companies, up from 5.2% last year. 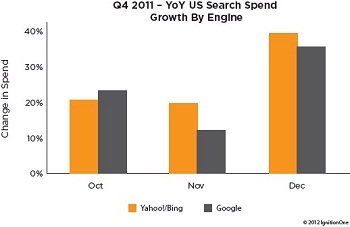 Although the Bing-Yahoo paid search alliance has grown slightly more than Google’s in November-December, Google is still in full control with 81.8% share of the total Q4 U.S. paid search spend. This also reflecting (more or less) the overall search engine market share. Two months ago, eMarketer released a forecast that the search ad spending will reinforce its ad spending share dominance over the mobile industry in the next few years and by 2015 it will be responsible for 40.2% of all mobile ad spending, while it was “only” 28.5% in 2011. Again, it is safe to assume that Google will benefit mostly from that (Google holds more than 90% of the mobile search share).